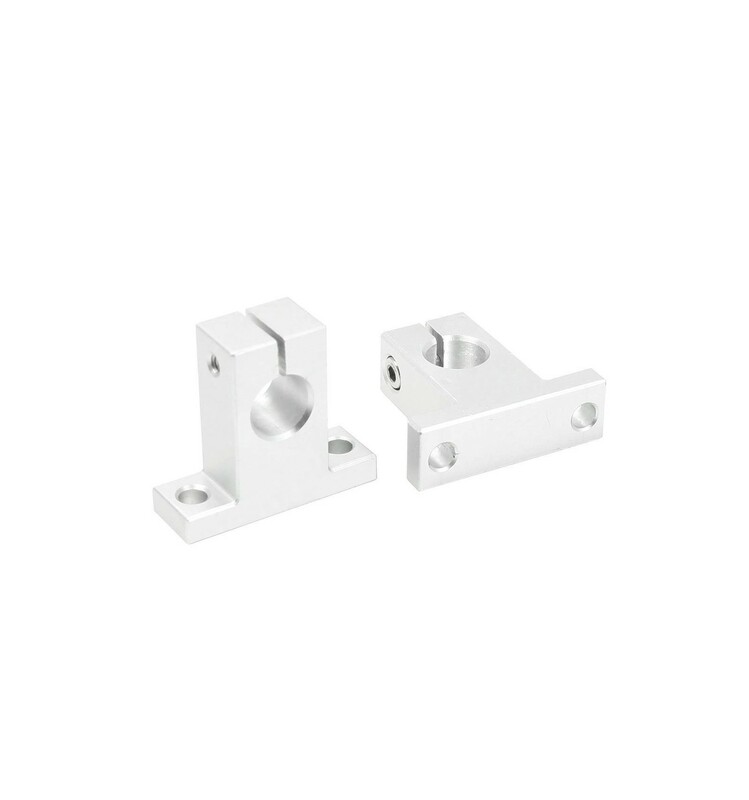 An aluminium made end support for securing 10mm linear shaft to 3D printers, CNC machines and other linear motion projects. This SK10 aluminium end support block can be used for intermittent or end shaft support. It is light weight, strong and suitable for all shaft types. 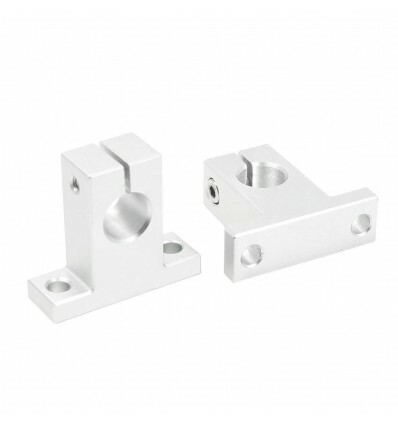 Many well-designed 3D printers, CNC machines and linear motion products make use of these end supports as they provide a convenient and firm method for securing 10mm linear shaft to the rest of the machine’s assembly, making use of two holes in the block’s foot. Due to the precise machining of the block itself, you can be confident that your linear shafting sits true to the rest of your CNC machine or 3D printer, resulting in a high-quality product. The rod is physically secured via a slit in the block, where a clamping screw is used to tighten the aluminium around the shaft. 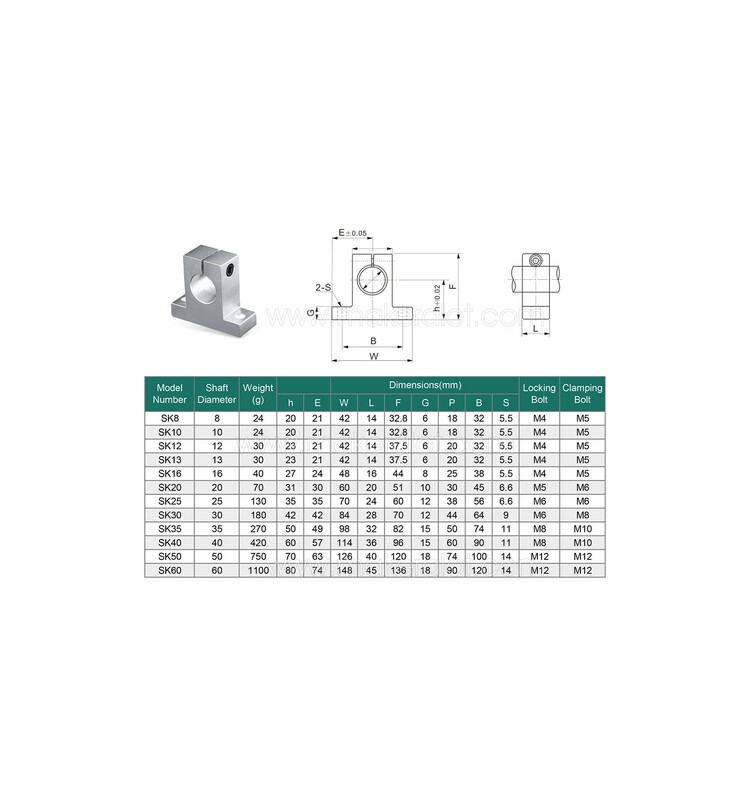 This friction clamping force, combined with a dab of locktight on the screw thread will create a failsafe connection, one that is an engineering industry standard. How to use this end support? Simply slide the shaft or rail through and tighten the clamping screw at the top of the block to fix it in place. You then make use of two M5 bolts to fix this to the rest of your assembly. If you ever need to disassemble or do any maintenance on your machine you can easily loosen the clamp and remove the shaft. For a detailed dimension drawing of this product see image in the product photo reel above. *Note that these are sold in pairs.